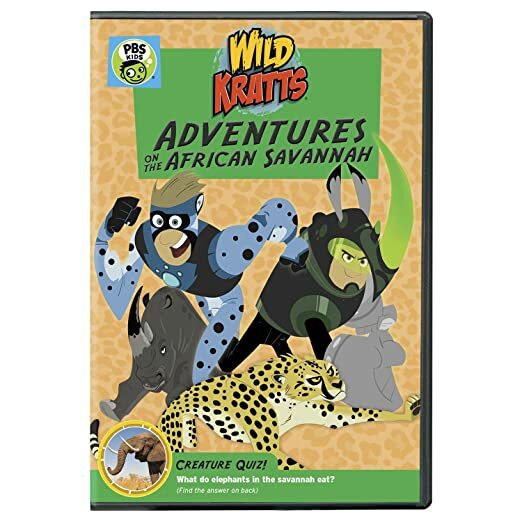 Wild Kratts: Adventures on the African Savannah - BUY THIS ON DVD! The Wild Kratts team learns all about the relationships between predators and prey, the differences between carnivores and herbivores, and how animals adapt to their environments in two exciting Adventures on the African Savannah! After getting caught in between a grumpy rhino and an outraged elephant, Martin and Chris have a contest to determine which is stronger - elephant or rhino powers! THEN SEND IN YOUR NAME, ADDRESS AND FIVE COMMENTS TO contests@efilmcritic.com orWeLoveHBS@aol.com. (Just one e-mail please.) Put "IS THERE WILD KRATT FEED?" in the subject line and cross your fingers. We will draw names and one of the prizes from PBS will be yours. Only 1 entry per household.